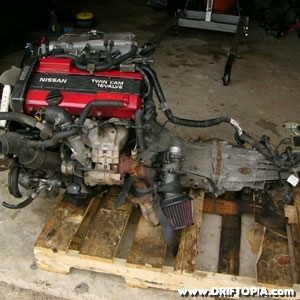 This page is a step by step guide to installing a CA18DET motor into a Nissan 240sx, specifically the s13 chassis. 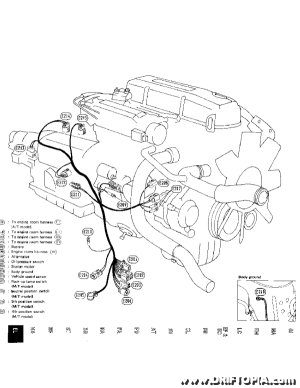 First and foremost, if you do not have the Factory Service Manual (FSM) I urge you to download it now. 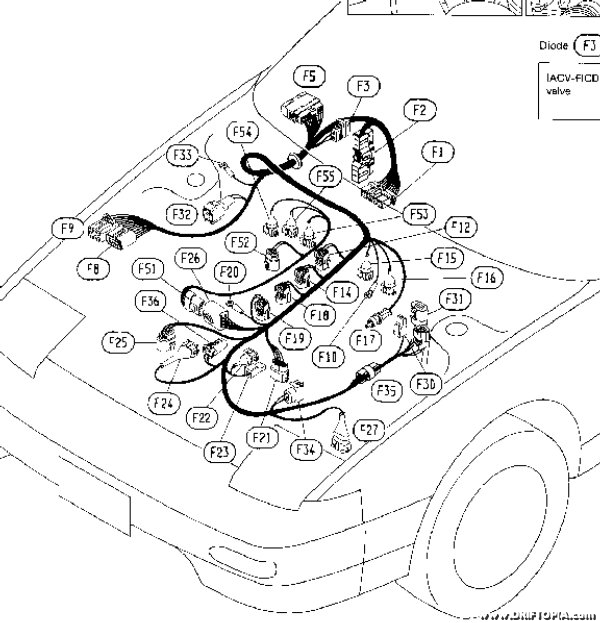 (1989-1994 Nissan 240sx (S13 – 180sx) CA18DET) This manual can help you with almost all of the problems you may encounter during this swap. The CA18DET is a 1.8 liter DOHC (dual over head cam) engine that was originally installed in the 1989-1991 Nissan 240sx world car. What that means is that while the US market car received a SOHC (single over head cam) KA24E motor rated at 140 hp @ 5600rpm and 152 ft-lbs @ 4400rpm, the rest of the world received a factory turbo, high revving, short stroke motor that produces 175hp @ 6400 rpm and 168 ft-lbs @ 4000rpm. When ordering your motor you will need to decide whether you want a motorset or front clip. 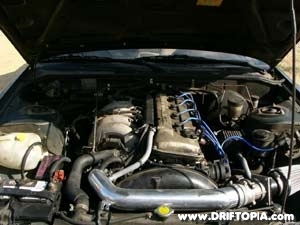 The motorset will be cheaper but will most likely come without the intercooler and piping. Make sure before ordering a motorset that it comes with the ecu, uncut sub harness, uncut ignition harness and the ignitor chip. These parts can be hard to come by and should be included with any motorset. Expect to pay $900 to $1200 + shipping for a motorset. A front clip on the otherhand is the front half of the car, shipped to your door. Choosing a front clip (aka half cut) adds to the price of your swap and increases your shipping cost. 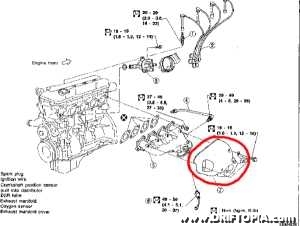 However, the motor will still be installed in the donor car so not only will you get to see how the motor sits, giving a novice a very good visual start to the swap, but it is almost guaranteed that everything needed for the complete swap will be in the engine bay. A CA18DET motorset will arrive on a pilot. I like using Yellow Truck for shipping as they will unload the motor into your garage. Before jumping into the swap, I want to cover two very basic rules that will save you from infinite headaches. First, buy a sharpie marker and a bunch of ziplock bags with write on labels. Everytime you remove a set of nuts or bolts, say for example the engine mount nuts, place them in a bag and write “engine mount nuts” on the bag. Then place all such bags in a common box. Trust me on this, it is very easy for nuts and bolts to “wander around” your garage, leaving you with the task of finding replacement parts. The second rule is to take your time. There are countless people who say they did the engine swap in a weekend. This will not be you the first time through. If it takes a week or month, don’t rush. 99.9% of swap problems result from rushing and not following and/or mis-understanding the directions. Whether your car has a KA24E or KA24DE motor, the removal process is the same. First, place your car on jack stands and open the hood. 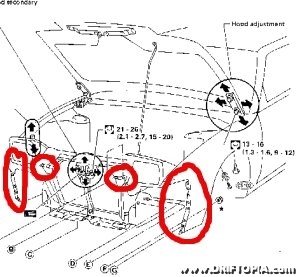 With a friends help, remove the hood by first disconnecting the wiper reservoir line and then, using a 14mm wrench, remove the two bolts from each side of the hood (the ones that connect the brackets to the body) and place the hood to the side. After this point we will be disconnecting electrical components so go ahead and disconnect the negative lead on the battery to ensure that the car has no power. Removing the front bumper and side panels is optional but I highly recommend it as it is very easy to scratch the body work of the 240sx during a swap. First, remove the two turn signals from the front bumper by unscrewing the two phillips head screws on each signal and then slide then out of the bumper, disconnecting their harness plugs once they are out far enough. Now remove the skidguard from underneath the front bumper and the splash guards from the driver’s and passenger’s side wheel wells. The front bumper is held to the two quarter panels by four nuts on each side of the car where the body seem is located. Use a 10mm socket with extension to remove these nuts from each side. 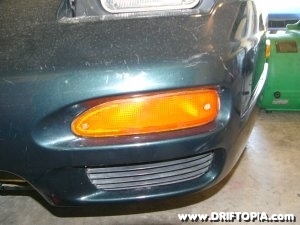 Then remove the 4 bolts located at the top front of the bumper and the bumper should pull right off. If the bumper seems stuck, check for any nuts or bolts that may have been missed. The front turn signals should be removed before removing the front bumper. Next remove the quarter panels by removing the two bolts located in the door seem. One is approached from inside the car with the door open near the top of the panel. The other is located towards the bottom and should be approcahed with an extension from outside the car at the lower end of the rear well. Now trace the panel down underneath the car and remove the 2 bolts holding the panel to the frame rail. Lastly, remove the 4 bolts from the top of the panel, where the panel meets the engine bay. Once all of the bolts are removed the panel should lift from the body with a slight upward tug. The first thing we want to do is remove the entire intake system including the factory intake box. Next, go ahead and remove the PAIR-valve assembly. The PAIR-valve assembly is the black box that connects to the intake and sits next to the strut tower on the driver’s side. Now remove the factory header by first removing the heat shielding and then disconnect the two, thick copper colored lines from the egr system. You will probably need a good rust penetrator to make these budge. Next, unthread the O2 sensor from the header and then remove the two carriage bolts from the end of the lower header. (this is where the header connects to the main exhaust) Finally, remove the 8 nuts from the head and snake the header out the top or bottom of the engine bay. 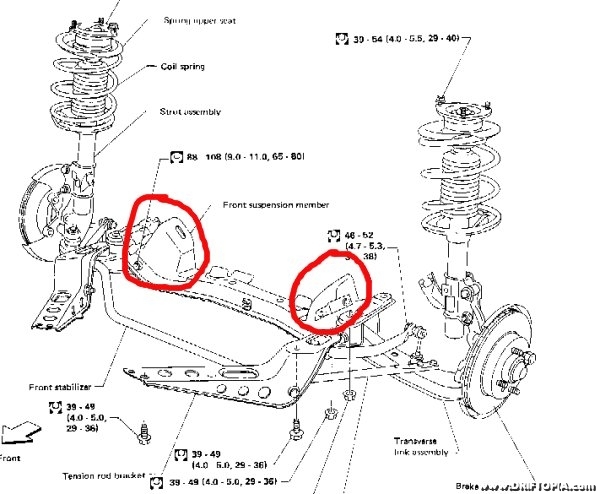 This is an expanded image from the FSM of the KA24DE header. The heat shield is circled. Next, with a large, 10qt oil pan, drain the radiator by loosening the plastic stop from the bottom of the lower, driver’s side portion of the radiator. (remove the radiator cap and the flow will increase dramatically) Now we need to get the coolant out of the block to prevent coolant from spilling when the motor is removed. There are two ways to do this. Either remove the lower radiator hose from the radiator and drain the fluid from there or use the drain plug located on the driver’s side of the block. 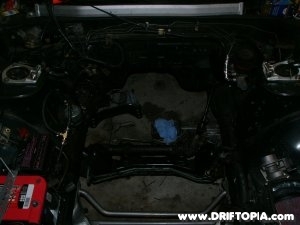 Now locate the 2 hoses that come from the the back of the intake manifold side and pass into the firewall. These are your heater core lines and should be removed or cut. Finally, remove the radiator shroud, radiator brackets, radiator and both of the radiator hoses and set them all aside for reuse later. Now the motor and transmission need to be drained. To drain the engine oil, simple unscrew the oil plug from the oil pan and let it drain into a new container. For the transmission, locate the plug on the bottom side of the transmission with a square receiving hole. You will most likely need to use a breaker bar and simply slide its end into the square hole to loosen this plug. You can drain the transmission oil into the same container you drained the engine oil into. If you are going to keep air conditioning in your car, unbolt the AC compressor from the block and set it to the side without disconnecting its lines. Otherwise, since you had it depressurized earlier, simply remove the whole assembly along with the AC condenser in front of the radiator. For the power steering pump, place a drain pan under the lower, thinner hose on the pump and remove the hose, draining the power steering fluid from the reservoir into the pan. Now remove the large hose from the top of the pump and set it to the side. Since the KA power steering pump is not used with the CA18DET motorset, you can leave the pump attached to the block. In order to remove the motor you must first remove the sub-harness and the E.F.I. harness. The sub-harness is the harness that connects the plugs(4) from the passenger’s side fuse box to the alternator, starter and transmission. 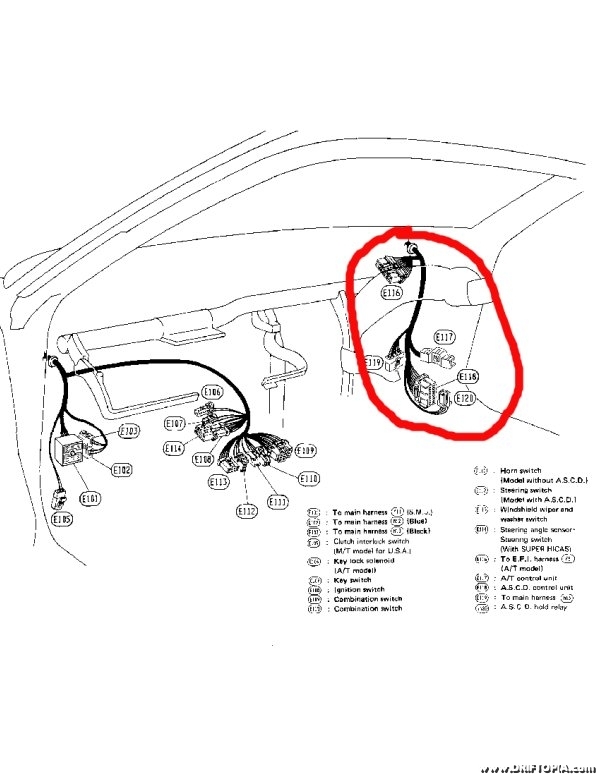 The simple premise for removing this harness is to follow any wire from the engine side of this harness to its connecting point in the engine bay. 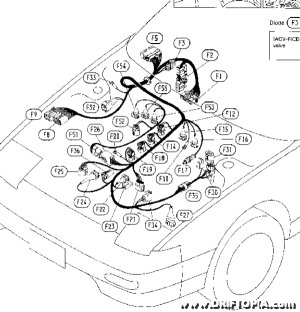 (Basically, visualize the engine being removed through the top of the hood and any wire that would prevent the motor from raising should be disconnected.) Once all pertinent plugs and grounds have been disconnected, you can drape this harness over the transmission and out of the way. Removing the E.F.I. harness is a little trickier than the sub-harness. The E.F.I. 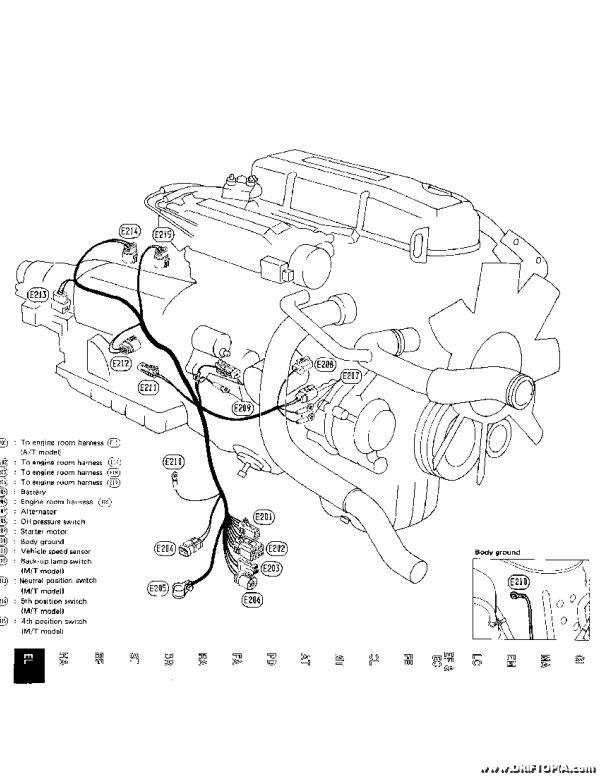 harness connects the dashboard and engine components by passing through the firewall after connecting to the factory ecu. First, the E.F.I. harness must be disconnected from the main harness. This connection lies under the dashboard. Remove the plastic panel under the glove box near the passenger’s side door. This will expose the factory ecu. Now remove the glove box by unscrewing the bolts at each corner. From the firewall, follow the E.F.I. harness immediately to the left then to the main harness plug. Disconnect the main harness plug and then, using a 10mm socket, unplug the ecu from the E.F.I. harness. Continue back to the firewall disconnecting any plugs that connect from the E.F.I. harness. Now pass the end of the E.F.I. harness through the firewall and into the engine bay. Finally, disconnect any plugs or grounds originating from the engine that connects to any component in the engine bay. 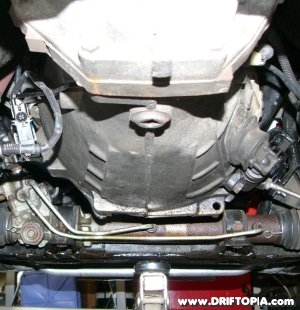 For example, start next to the battery and then work around the perimeter of the engine bay, disconnecting plugs as you go. Once these plugs are removed you can lay the E.F.I. harness on top of the engine. The 240sx has a 2 piece driveshaft that is quite easy to remove. First, locate where the 2 pieces connect by finding the joint just aft of the center bearing. Disconnect this joint using a 14mm wrench. Be sure to engage the parking brake or the driveshaft may spin when pressure is applied to the wrench. The rear half of the driveshaft can now be pulled downward and out of the way. Next, with a 17mm socket in hand, remove the 2 bolts from the lower bracket of the center bearing. With the lower bracket removed, pull the front half of the driveshaft rearward and it will slide out of the transmission. 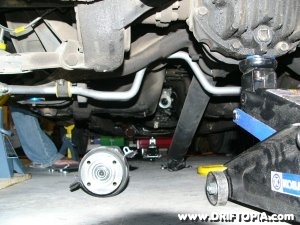 The 240sx has a 2 piece driveshaft, the two pieces need to be separated before removing the center bearing. 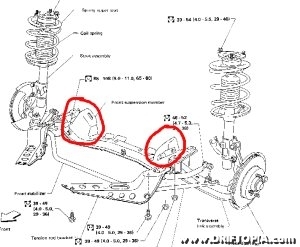 This image shows the rear and front halfs of the driveshaft resting on the ground. Following a straight line from the rear differential, you can see the hole where the front half of the shaft plugs into the transmission. Note: The newly exposed hole in the rear of the transmission can be plugged at this point. Please note that without plugging, the transmission will more than likely leak fluid onto the floor when the motor is removed. If you don’t have a plug, lay some cardboard on the floor to soak up any fluid that might spill in the next few steps. In order for the engine and transmission to come out together, the shifter must be removed from the transmission. Grab the shift knob firmly and turn it counter-clockwise to remove it. Now pop the center plastic off of the center console and then remove the upper boot by loosening the 4 x 10mm bolts. Next, remove the lower boot, this should slide off the top of the shifter once the ziptie at the bottom is cut (yours may have a metal reatiner instead of a ziptie). Now follow the top of the shifter down towards the transmission and you will find a c-clip. This clip must be compressed with either ring compressors or needle nose pliers and then moved out of its groove in the housing. Once this is done the shifter can be pulled out of the transmission. (Be patient here. Sometimes these clips remove easily and sometimes you have to balance pliers and a flathead screwdriver to pry it out.) 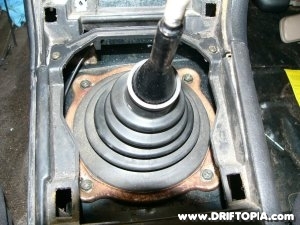 Place a rag in the shifter hole to prevent debris from entering the transmission. The upper shifter boot is exposed once the center console plastic panel is removed. With properly rated chains (500lbs +) and clips (500lbs +), place the engine hoist leveler onto the top of the motor with its crank facing the front of the car. Next, snake the front chain around the motor to where the chain will slide behind the oil pan once it is placed in tension. Now snake the rear chain around the back side of the engine mount brackets. It is ok to thread the chain through the intake manifold gaps if necessary. Now connect the leveler to the engine hoist but do not raise the hoist arm. Locate the engine mounts and remove the top nut from the passenger’s side and the lower nut from the driver’s side. On the underside of the transmission, you will notice a bracket that connects the rear center of the transmission to the transmission tunnel. 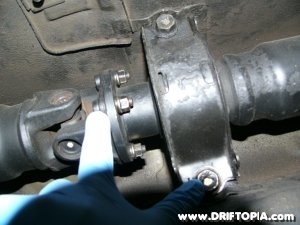 This bracket is the transmission cross-member and is the last connection between the car and drivetrain that needs to be disconnected before your KA motor can be removed. First, place a floor jack under the transmission to prevent the drivetrain from pivoting downward once the cross-member is disconnected. With the jack in place, remove the 4 – 17mm bolts from the brace and then proceed to the front of the car for the final step. Check back soon for Part 2: Installing the CA18DET.